For some reason it is not possible to successfully operate Fulgurex point motors with a DS64. We have determined that the Fulgurex motor draws too much current for the DS64. Published sources describe the Fulgurex motor as needing 400 Ma for operation, which is well beyond the capacity of the DS64. 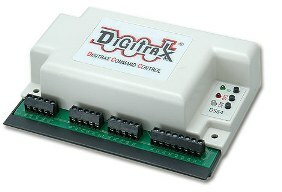 When the DS64 tries to operate Fulgurex motor, the excess current draw appears to be a short circuit and the DS64 shuts down to protect itself. The Tortoise, while also a slow motion point motor, is "on" all the time since it is a stall-type motor. That is, a small amount of current is running through the Tortoise at all times, which keeps the points pressed up against the stock rail of the turnout. Typically, the Tortoise draws about 8 Ma, considerably less than the Fulgurex.